Coyotes are widely distributed throughout North America and can be found in 46 states. They are gray in color and weigh between 20 and 35 pounds. It's believed they mate for life. Coyotes produce one litter of pups each year. Females carry their first litter when they're between 1 and 2 years of age. Breeding season for coyotes is between January and March. Pups are born within nine weeks. Litter size is determined by food availability and population density, although the average size litter is between five and seven pups. In areas where coyotes are less abundant, a female may produce a larger litter of eight or nine pups. 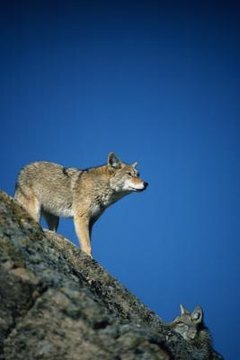 Mortality is high among young coyotes, with 50 to 70 percent never reaching adulthood. Each year, 30 to 50 percent of the adult population dies off as well, due to hunting, trapping and vehicles collisions. Oftentimes, coyotes try to even out these numbers by producing larger litters; coyotes have been known to produce litters as large as 17 pups. How Often Do Cheetahs Give Birth?